The Living Light Essences are a series of self healing essences based on vibrational medicine and homeopathic principles that can give a new positive direction to your life. When you take Living Light Essences, unwanted quailities such as doubt, anxiety, fear and poor self-esteem are transformed into such positive qualities as love, truth, peace, courage and strength. They are available over the counter or with an alchemical assessment, recommendations can be done on site or from a distance. These essences are available from the Able Crystal Shop. "The Essences, which were created based on the Seven Rays specialize in helping people to address the emotional, psychological, and spiritual elements of health, such as stress, self-esteem and finding life purpose." The Living Light Gem Essences are the most grounding and practical of all the essences, helping us recognize and change the way we move forward in our lives, how we carry out everyday activites, and how we deal with daily challenges such as staying focused, self-confidence, awareness, maintaining balance, effectively dealing with stress and anxiety, and letting go of thing that no longer serve. The Living Light Archangel Essences are based upon the archetypes of the seven Archangels - Michael, Jophiel, Chamuel, Gabriel, Raphael, Uriel and Zadkiel. These Essences is the most integrative of the essences and reach a deeper level of the self. They act as a bridge between the physical and the spiritual, assisting us in balancing and integrating specific higher principles and qualities of being into our everyday lives. They are helpful for a broad range of challenges including: truth, insight, loving patience, purity, healing, sharing with others, and forgiveness. The Living Light Divine Flame Essences are based upon the cosmology of the Seven Rays directly, and represent the world's first essences of the Seven Rays. The Seven Rays outline seven key principles behind all life, including amongst them - Love, Wisdom and Truth. These essences are the most uplifting and transformative, and help to address issues closer to the soul including: direction, purpose, strengthening common sense, loving without condition, finding harmony, living up to your potential, and much more. The Living Light Special Essences are the most inspirational and powerful of all the Essences, assisting us in becoming more conscious, and establishing deeper and richer connections with the more spiritual aspect of ourselves, and the 'divine' within. This series helps to heal the primary archetyes of Mother-Feminine, Father-Masculine, and Child. These essences work at the deepest level of the self, and help to strengthen the virtues of righteousness, vitality, feminine spirit, and the spiritual mind. 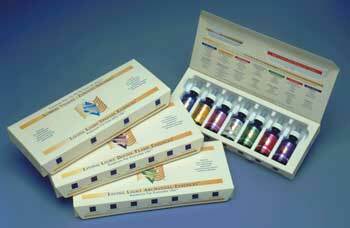 The Living Light Rainbow Essences are a series of colour and gem, crystal and/or mineral combination essences. These new essences were created to help individuals with the intense new energies and challenges we have been and are continuing to face at this present time. Essences are available in 1oz dosage bottles for $21 each. Essences are traditionally taken as a few drops under the tongue. Michael is certified by the Living Light Corporation to practice Gem Essence therapy for others. To find out more about how Living Light Essences can help your life, contact Michael Stodola in Saskatoon, Saskatchewan by phone at (306) 955-4332 or by e-mail at devas@ablecrystals.com. Michael is fully trained and certified to administer Living Light Gem Essence Therapy. Each Essence has a series of qualities that it carries. These are the qualities and characteristics of the Essence itself. When you take that Essence, what the Essence is actually doing is acting to strengthen or magnify (through sympathetic resonance) those exact qualities which you already have within you. By strengthening these specific qualities, you are actually developing those attributes, which you already have in a state of potential. This in turn helps you to overcome the symptoms or imbalances mentioned in the right-hand column for that specific Essence. Each Essence also has "imbalances" or symptoms noted for it. This does not imply that the Essence has these qualities, but instead acts to help you to overcome them by strengthening the corresponding positive quality. Therefore, if you are experiencing one or many of the "symptoms" noted in the right hand column, then that is an Essence that would be well-suited to you at this moment. The more "symptoms" or "imbalances" you are experiencing that relate to a specific Essence, the more likely that Essence is a top priority for you. As your understanding of qualities and imbalances deepens, you will find that they are very much a part of the same larger principle or concept. I have also noted conditions that are related to an Essence. The Essence is not a cure for this condition. The symptoms that people experience who have that particular condition often describe the "imbalances" of that Essence. This is why the condition is noted as being related. However, it needs to be understood that the particular principle which the Essence embodies, directly relates, in part, to the condition mentioned. Hence, it is a key to understanding, and can be part of the solution. In my work, I have also noticed that conditions themselves are generally the result of becoming out of alignment with more than one universal principle. This means that the solution has multiple principles involved and that the complexity is deepened. For example, if you are feeling sad, than all you need is joy - otherwise known as illumination, thus taking Archangel Jophiel Essence will help tremendously. If you are depressed, this Essence is only part of the whole solution, as depression is more than just sadness. Archangel Jophiel is still the number one ingredient of that solution, but not the whole answer. In depression, people often exhibit tendencies towards extremes - addressed by Sacred Emerald - Balance. In my experience, I have found that in many cases of depression - depression results from past trauma or abuse that has been buried and not healed. Years later it surfaces in the form of depression. Archangel Gabriel - Purity - helps to address this aspect of the condition. So as you can see the total solution is more involved than simply one Essence. Also, Essences are best combined with personal awareness and understanding as much as possible, as this acts to further the healing process, and in some cases is a requirement for complete healing to occur. If I have noted a condition beside an Essence, it is because in my opinion, this is the primary principle that relates to the condition itself. - Jeff Binder, Living Light Corporation.